When it comes to product packaging, primary packaging deals with the first layer of packaging that directly contacts the product. Secondary co-packing services refers to the next layer of packaging used to group various pre-packaged products together. This final packaging function can include kitting, bundling and sealing products in hundreds of different ways to ready them for retail sale. Many consumer goods manufacturers utilize contract packaging companies to handle this final packaging. But handling the function in the distribution center can cut up to 30% off total distribution costs, and 7 days off distribution cycle time. What makes these benefits possible is the increasing sophistication of third-party logistics providers (3PLs), the firms who often run large DCs. These 3PLs have invested in the equipment and expertise to offer complete product customization and distribution services. 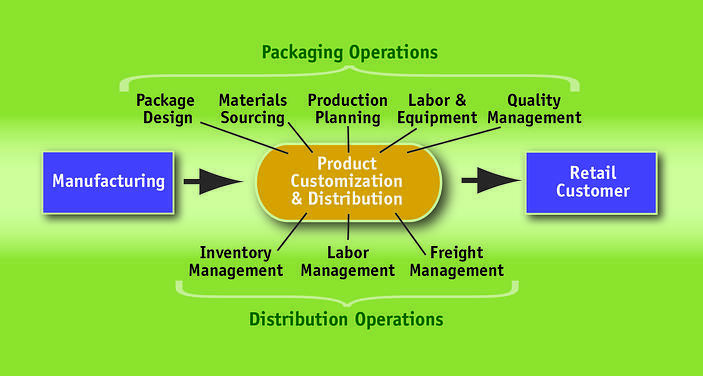 The accompanying diagram illustrates how these 3PLs are combining multiple functions into one integrated solution for secondary co-packing services and distribution. Large CPG companies want to convert manufactured products to cash as soon as possible. Many have recognized the inefficiency of investing time and money moving freight to multiple partners prior to shipping to retailers. The largest companies are now using their 3PLs to cut supply chain cycle time by as much as 7 days. Kimberly-Clark has consolidated co packing services and distribution operations into 10 3PL-operated mega-centers across North America. When Procter & Gamble integrated co-packing services into its distribution operations, the company cut costs 10% at its Northeast paper DC. Reduce freight costs. Typically, companies that use outside contract packagers move freight from the distribution center to the packager and back to the DC – adding 38% to the freight bill in the process. Lower inventory carrying costs. Using an outside packager adds about 7 days to the distribution cycle, adding inventory to the system – along with the labor, storage and financing costs to carry that inventory. Reduce labor costs. The same management team can be used to supervise both the distribution and co-packing areas. Also, cross-trained workers can be shared across functions to optimize labor efficiency. Reduce damage. Shipping products back and forth between packagers and 3PLs results in about 3% damage, further eroding profits. Read about additional cost benefits in our Viewpoint paper: Integrating Contract Packaging into Logistics Operations. When you combine supply chain functions into a single 3PL-operated location, you reduce freight and labor costs and get products to market faster. Who handles your co-packing services? If the function is performed outside your distribution center, perhaps it’s time to give your 3PL a call.